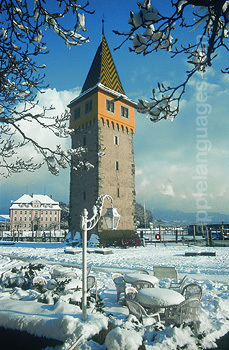 If you’re looking for a unique lakeside location in one of Germany’s most striking regions, then learn German in Lindau! Lindau is an historic island town in southern Germany, right on the shores of the beautiful Lake Constance. Lindau’s unique geographic location, at the meeting point of Germany, Austria and Switzerland, gives the town a truly international atmosphere. 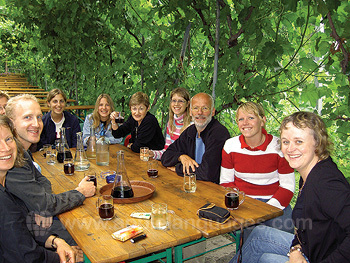 On a German course in Lindau, you’ll be ideally situated for enjoying all that life outdoors can offer. With long hours of sunshine in the summer, and excellent skiing opportunities in the winter, Lindau is perfect for nearly every conceivable kind of sport. From sailing, windsurfing and rowing on the emerald green waters of the lake, to walking and winter sports in the Alps, you’ll be spoilt for choice! 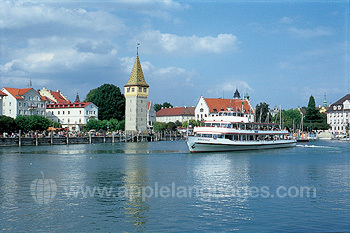 Our German school in Lindau is located in a beautiful historic building in Lindau’s famous harbour. The school is exceptionally well-equipped, with 6 spacious and comfortable classrooms, a school cafeteria with terrace, a library and media room, plus a free school cinema. 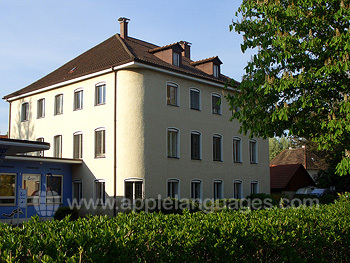 What’s more, because of its ideal location, the school enjoys wonderful views of Lake Constance and the Alps. 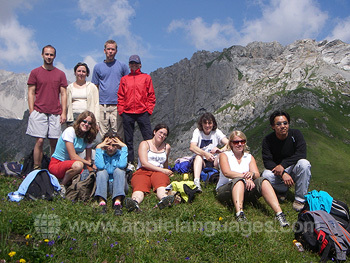 Our Standard Course is our most popular German course in Lindau, comprising 20 lessons/week, leaving plenty of time to enjoy the lake and the Alps in the afternoons. We also offer an Intensive Course (25 lessons/week) and special interest courses, including one-to-one lessons and exam preparation classes. Don’t forget that if you study for 8 weeks or more at our school in Lindau, you can apply for a work experience placement in a local company. 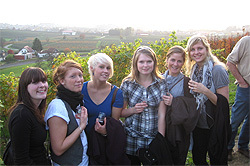 As a student on a German course in Lindau, you’ll benefit from the extensive cultural activities program run by our school. The school usually arrange two activities per week, examples of which include guided walks, sports, bicycle tours, bowling and barbecues by the lake. 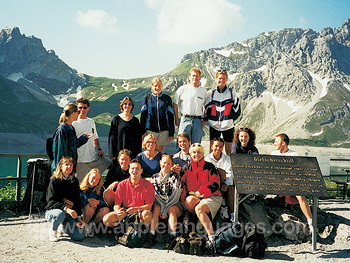 The school also regularly arranges excursions to places such as Meersburg, the oldest castle in Germany, and to locations such as Munich, Switzerland and Zurich. To get to Lindau, you can fly to Friedrichshafen (daily flights from London Stansted). Friedrichshafen is just 20 minutes from Lindau. 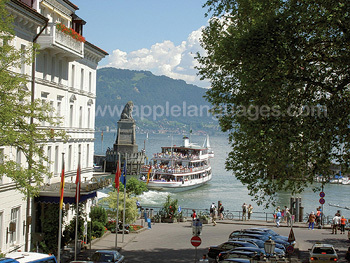 Alternatively, fly to Zurich, Munich or Stuttgart Airport, and take the train to Lindau. We can also arrange airport transfers if required. Please contact us for more information. Average score for our school in Lindau based on 27 previous client reviews. The course was set up perfectly. I really cannot fault my experience. The lessons were well structured and the course was interesting. Any difficult material was explained well and help was always available. The activities were also great fun and added to my time at the school. My accommodation was great. The family treated me like one of them and I was always looked after! Very friendly and made my stay at Lindau excellent! I would recommend this to anyone wanting to improve their language skills, or even if you're looking to have an exciting few weeks. I heard about the course from your newsletter. The area was better than I had expected. The school and teachers were excellent. The lady I stayed with talked German with me . She ate meals with me and made me feel at home. She was perfect. The area, the school and the accomodation could not have been any better. They were all outstanding. Thank you. It improved my german signifacantly taking in regard I was just one week in Germany. Good teachers. M host family was just fine, a friendly athmosphere. I had the luck there was an other student at the host familty that folowed the same course in German. We spoke a lot with each other. The staff were very helpful and friendly. The facilities in the school were good and the trips organised were fun if not always educational. I would say that toward the end of my stay the range of ability in the class was too great. this is in part due to the relavtivly large class sizes and/or too few teachers. in the whole good. I liked the atmosphere of Lindau and the school- a little historical island, a small school and at the course I felt like in a family (the teachers were very friendly!). The only thing I would have liked to change was the teaching method. I would have preferred a more intensive course (the pace was rather slow for me). 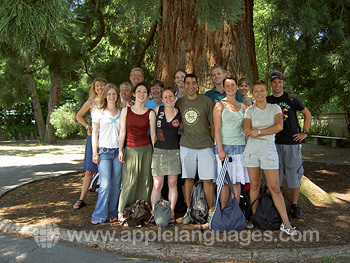 The value of an opportunity to learn a language in the country in which it is spoken is inestimable. 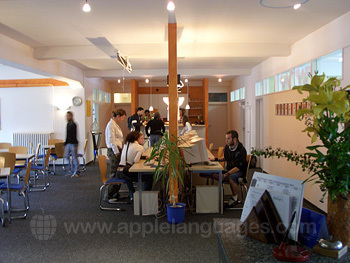 The language school in Lindau has just the right balance between emphasis on academic achievement and an enjoyable learning environment. The extra-curricular activities are well pitched to offer something for everyone and this helps to allow everyone to feel included in the overall programme. The accommodation provided in Lindau is fairly basic, but perfectly clean and adequate. The environment is well suited to a friendly and sociable atmosphere. The course was good and the school was well organised and the staff helpful and friendly. The style of the lessons was perfect; it consisted more of discussions and engaging activities which imitated more realistic situations. The teacher was also excellent. The family I stayed with were extremely friendly, helpful and patient. The teachers were lovely and always explained everything in such a clear manner. Our room was absolutely huge - it was great. Good course. Excellent teachers and friendly staff. Wish I had signed up for 6 months! Lindau is a good location. I like it! This is one of the best things I have done. I am so glad I decided to give it a go! It has given my confidence a boost as I did not think I would be able to learn a language, having been hopeless at school!! I would certainly recommend it to others. 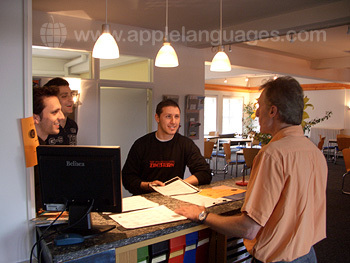 Friendly teachers and very well suited to students' level and needs. Very open and lively atmosphere in classes, the average age in my class was about 22. Many possibilities for afternoon activities and excursions, school cinema every Tuesday night (well-known movies in German, with subtitles). I would recommend it to anyone (young at heart) wanting to learn or practise German. Clean and friendly student residence, the atmosphere was excellent. The kitchen was kept clean by students, and was also an excellent meeting point. 5 minutes by bike, 20 minutes walking to the school, and 8 minutes on foot to a shopping centre. The Lake Constance (Bodensee) area is marvellous. The course was good and the staff were nice and friendly.